Last time my mother came to visit, she brought with her an apple slinky machine. 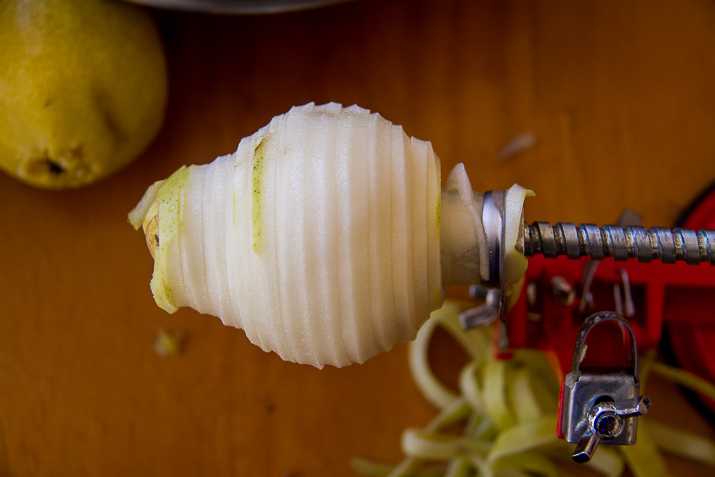 You know those gadgets which peel and core the whole apple just by turning the handle? They made quick work of all the apples I was using to make apple sauce. The kids have been eating several apples everyday now that they can just use the machine. Something about an apple slinky just makes it tastier. We have discovered that the apple slinky machine works really well for potatoes (hello curly fries) and pears as well. So when I got my hands on some beautiful pears recently, I grabbed out our slinky machine and had them peeled and cored in the blink of an eye (well almost – you get the idea). 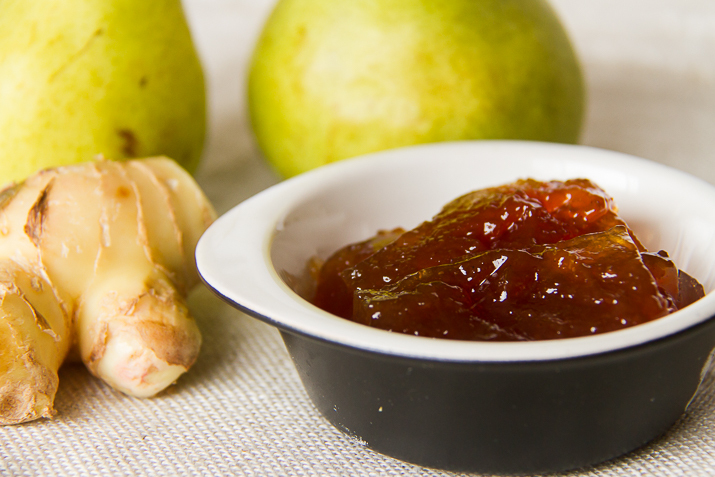 I had in mind to make some pear and ginger paste, to have with cheese platters and the like over the next few months. I love my plum paste recipe, so I based this recipe on it. I used the jam setter because I wasn’t sure that it would set well on its own. 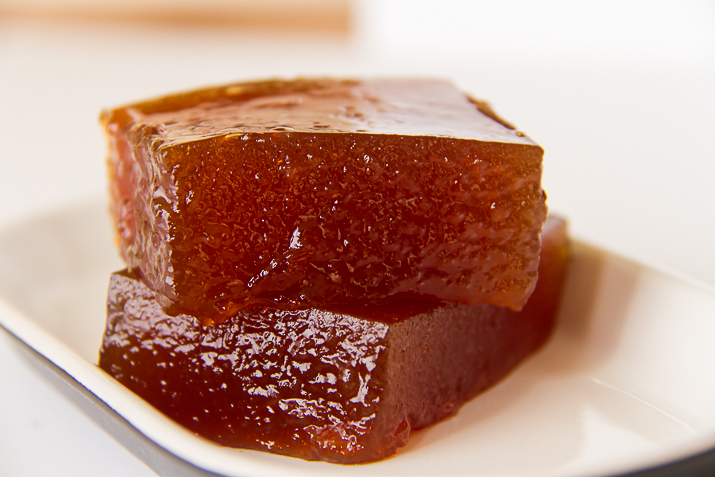 Jam setter is just pectin (the natural gum found in some fruit which causes fruit jams to gel). 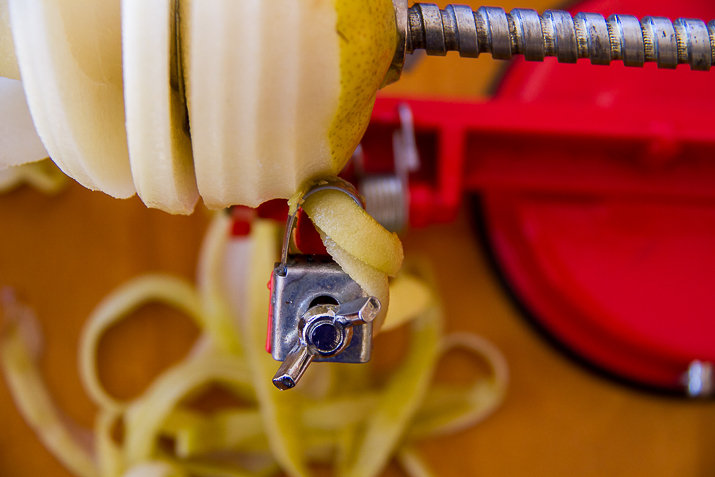 Peel, core, and slice apple and pears (I used our apple slinky machine). Place into a large saucepan and heat gently until the apple and pear collapse. Peel and finely grate the ginger and add to the apple and pear together with the cinnamon and lemon juice. Add in the sugar and jam setter and stir gently until the mixture simmers and the sugar has dissolved. Once set, wrap in baking paper and store in an airtight container until it is needed. Have you ever used a apple slinky machine? Love pear paste? Previous Post: « 6 Ways To Live The Country Life… Even If You’re Not In The Country! Hey, I found this the other day and made it tonight. IT’S GREAT! Thanks so much for sharing your recipe. No problem 🙂 Glad you enjoyed it! It fills an 18 by 28 cm tin.